My husband has had me on a spending freeze (to be known as s.f. from this point forward) since Sunday. My girlfriends know exactly what I mean when I say this term, because my husband likes to put me on them quite often. Granted, I don’t necessarily follow his instructions. Sometimes it’s more of a…frost instead of a freeze. Regardless, I’ve been on one this week, and it’s been tough…to say the least. Today the s.f. has been lifted, and what better way to spend money and feel like you’re not spending it than by going to the Dollar Store!? While I didn’t necessarily walk out with bags-full, I feel like I got some really good stuff. For all you math wizzes out there, you will see that I spent $5.00. The rest of you? Just take my word for it. 😉 I bought this adorable tin (the bigger one was out-darn it!) for my classroom. Buying items for my classroom allows me to have an extremely girly outlet. I figure I’ll put eraser tops in it. (Note to moms of teenagers: Add eraser tops to your back-to-school list…kids never have them.) Plus, it’s always humorous to see my teenage boys getting into such a girly box for supplies. They HATE it. The wrapping paper is my favorite! I am a FAN of all things wrapping. Don’t let this proclamation fool you, however. I generally spend all this money on wrapping supplies only to run into the store on my way to a party and “wrap” it in a bag and some tissue in the parking lot. Some day I will get my program together and actually use this stuff more regularly. Until then, my favorites tend to be….no, ARE…solid papers. I prefer things to be simple. 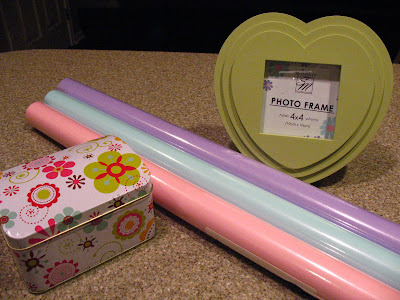 Plus, with solid colored papers, you can use all these fun ribbons to decorate it with! I’m not necessarily happy with it, but it will do for now. Add it to my list of projects, I guess. Until I get started, hopefully you can give me some suggestions (or not)! Can’t wait to hear from you…please?…anybody? I too looove ribbon! I’m sorry to say that I don’t have any great suggestions and only wish that my ribbon supply is as organized as yours! I came across your blog by way of the nester. I’ve been checking back often and thought I should leave you a comment to let you know that I enjoy your blog. I also noticed you are from MI. Thanks for sharing! okay, i can’t stand it now, chris! those ribbons and papers are EXACTLY what i have and would pick! hello my twin! We’ve done some spending freezes around here too. Whew! That can be tough. 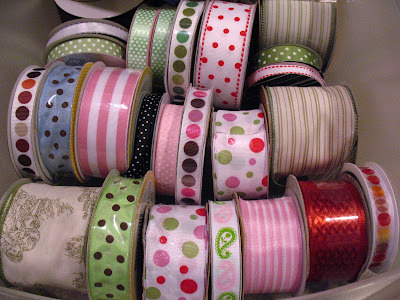 I can’t really think of any other way to organize your ribbon. That looks pretty good to me. A spending FREEZE? Say it isn’t so!! I put my ribbon in a plastic basket that has holes in it. I thread (do you ‘thread’ ribbon?) the ribbon through the holes and leave a little poking out. I used to keep it on my desk when I scrapbooked. But since I haven’t actually scrapped in like.. a year… the basket is shoved into the drawer in my desk. lol Your’s is way cuter. I’m a self profess ribbon addict! I’ve been trying to get by on cheap lately too! I love ribbon too! I like how you have it organized! I am a ribbon girl too. I got a cheap, small, non-extravagant curtain rod. I mounted it to my wall next to my craft desk and I slide them on. Always on hand when I need them. It works GREAT for me. I saw a blogger that hangs them on pant hangers. Ok, so I know that this is a REALLY old post, but I came across your blog last weekend, and have spent all of my free (and not so free) time trying to catch up on ALL of your posts. I'm addicted to your site, and I think it's a problem. Go ahead, call me a stalker, but not to worry, I live a long way away! You have probably found a solution by now for the ribbon, although I think it looks pretty organized to me. 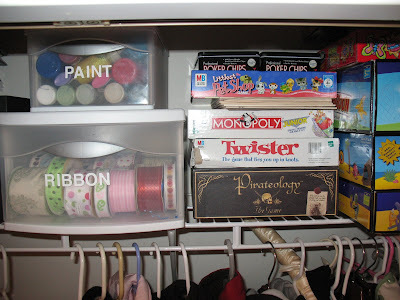 I do something similar in that I have a craft dresser and have a drawer in it that I place my ribbon in so that I can see them all when I open the drawer…. conveniently placed under the wrapping paper drawer! Ok, back to reading. Someone may have already suggested this..but I'm a ribbon addict and use a stackable holiday ornament storage (the clear kind) container….Great blog, just discovered it!